So…I’ve decided to do these posts. What does it mean? Just what it says. The forgotten. In this case I can embarrassedly admit to completely forgetting I have ever purchased an album. Then when iTunes or my iPod’s random shuffle feature hits on a certain song, I’m looking to see immediately just who the artist is and just what the song is. How is this possible? Um…well…currently my iTunes library contains 8,695 songs. Which…is the equivalent of 22 days 5 hours 46 minutes 35 seconds. Some songs in my library, with shuffle turned on and repeat turned off, have never been played a single time (but…this is not counting multiple computers and crashes, installing and uninstalling iTunes, and whatever crops up). So, that number isn’t 100% reliable. Also…this is only a fraction of my music collection. I have a whole bunch of cassettes and CDs. Granted, not as many physical Asian albums, but plenty of country, rock, and pop. I guess, that’s why it was so amazing that I bought Activity’s EP and actually had the thing on repeat…so I’ve listened to it in its entirety over a dozen times since its purchase. It’s the last thing I listen to when I go to bed and the first thing I listen to when I get up. Anyways, this series will be covering those albums and songs I rediscover after purchasing and forgetting them. First up is Shin Cho-I with Go! Dandy Boys. How sad. I think one of their songs made my music recommendations last year. How come I haven’t played their album before? I’ve never watched Voice Korea which apparently helped Shin Cho-i gain popularity. I liked her debut song “Bad” which, if I remember correctly, was part of The Berlin Files OST or something like that. It was a Korean action movie that looked interesting to me. Now…I watched parts of Top Band 2. The show on a whole suffered from tons of problems and was really just too confusing and really didn’t do the bands participating a whole lot of justice. Apparently, 가자미소년단 [Gajamisoneyondan aka Go! Dandy Boys in English] failed to advance in the first…or was it second round? Of that show. They supposed made their official debut in 2010, but I really am having a hard time find some English sources for more info on the band and my Korean, as I’m sure you know by now, isn’t the best. Oh, I can read it…but my comprehension of it isn’t very good yet. Hopefully that shall change in the future. Shin Cho-i collaborated with Go! Dandy Boys forming the unit Go! Dandy Boys Plus Shin Cho-i. They released the mini album 가자미소년단 더하기 신초이 [Gajamisonyeondan Deohaji Shin Cho-i] in September of last year. Their song 너의 곁에 있을게 [Neoui Gyeote Isseulge; By Your Side] made it on my September Playlist (#166). I liked the song enough to buy the album…but then never actually listened to it! Shin Choi-I’s vocals really go well with the Dandy’s vocalist. Too bad I don’t know the band member’s names. I really do like their album as a whole and I’m sorry that I forgot about them. An overall good CD. It has more of a pop rock sound. I really enjoy the first 2 songs. “Black” however…starts really weird to me. Not necessarily a bad thing, but the beginning isn’t really my cup of tea. After the weird whispering start passes and we get to the meat of the song, I can say at the end that I do like the ballad-like song for the most part. “Hi Five” is actually the song that helped me rediscover this CD and this great collaboration. I recently, accidentally, downloaded all 250 songs from my most recent purchases. This has allowed me to discover artists, CDs, and songs I had totally forgotten about. So it was a happy accident in some cases. “Hi Five” has a funky sound and is a fun song. The album ends with “My Destiny” which takes you back to the sound of the first two tracks. I must say that I really would like to hear more of Shin Cho-i as a solo artist and in collaboration with this band. I’d also like to hear more of this rock band’s own music. While this album won’t top my list of favorite albums, it’s definitely one to listen to and not a purchase I regret making. iTunes does have an album by Go! 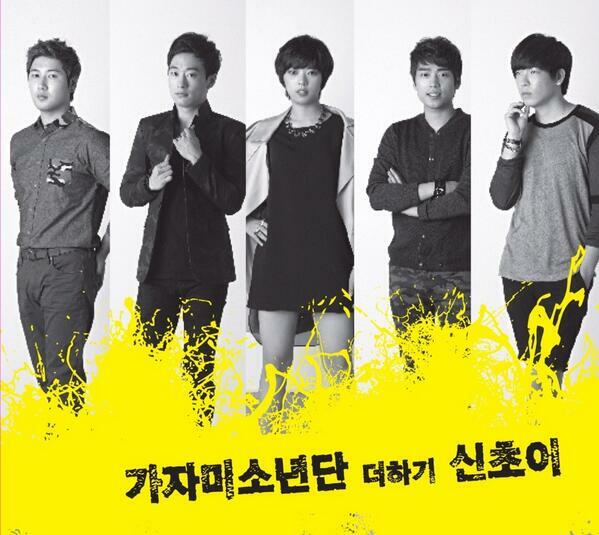 Dandy Boys – Earth Boy, plus they also participated in the horrible drama Who Are You‘s OST. iTunes has that single release as well if you’d like to hear more from them.